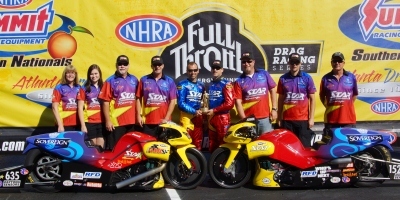 As a newly assembled crew this season, the Sovereign-Star Racing Team was extremely proud to take home a small Wally for “2012 Best Appearing Crew” at the Summit Racing Equipment NHRA Southern Nationals in Commerce, Ga. The recipient of this award is chosen from the approximately 400 team entries at each event. After adding a co-sponsor this season, the Star Racing Team transformed their normally red and yellow ensemble to incorporate the blue shades of the new Sovereign logos. The change can be seen throughout the crew’s presentation, including new paint and decals for their 2010 S&S powered XB12R Buells, custom racing leathers from Vanson Leathers, an eye-catching logo addition to the team’s transporter and newly-designed crew shirts that were also made available to the public. The Sovereign-Star Racing Buells and S&S Cycle engines, which competed in and won the 2011 UEM European Championship with the help of Star Racing owner George Bryce, were provided by the team’s Hungarian co-owner, Jeno Rujp. The Commerce race was the second NHRA event that Rujp attended with the team. His first visit to the Houston race was followed by an opportunity to travel back to Americus, Ga., on the Sovereign-Star Racing transporter with several of the crew members. At Commerce, the Sovereign-Star Racing drivers, Scotty Pollacheck and John Hall, qualified 9th and 10th, respectively, in the Pro Stock Motorcycle class, despite running in the 7.0’s during qualifying. However, the crew improved both bikes’ performances to run in the 6.90’s on Sunday in Eliminations. Pollacheck took the hole-shot win in Round 1 with a 6.983/187.68 against LE Tonglet on his GT Racing Suzuki. Hall, who redlit against Karen Stoffer in the first round, ran a 6.971/189.34. In Round 2 Eliminations, Pollacheck faced #1 Qualifier Hector Arana on his Lucas Oil Buell. Arana took the win against Pollacheck with the quickest run of the weekend at 6.863/195.28. “I think that the biggest and best thing was qualifying # 9 again and winning the first round again from the #9 spot,” Pollacheck said. “We beat a very formidable opponent in 2010 Pro Stock Champ LE Tonglet.” Pollacheck also qualified 9th and won Round 1 at the Pro Stock Motorcycle season opener in Gainesville, Fla.
Pollacheck is currently #8 in the Full Throttle Series Point Standings, and #11 Hall trails the Top 10 by only 7 points. The team’s next appearance will be June 1-3 at the 43rd annual Toyota NHRA SuperNationals in Englishtown, N.J. The Sovereign-Star Racing Team would like to thank the following sponsors: Sovereign, Star Racing, S&S Cycle, Daytona Sensors, Worldwide Bearings, Americus Motorsports Complex, Who’s Up Next?, and Quality Tire.